nutraquin+ is a fast acting horse joint supplements containing the necessary high strength ingredients that help maintain healthy joint function in horses whilst supporting the natural systems that control inflammation. nutraquin+ has received fantastic feedback from vets and pet owners alike. Fast acting - The benefits of nutraquin+ are noticeable, on average within ONE week due to its high strength formula and the inclusion of Boswellia Extract which supports the natural systems that control inflammation and has over 400 independent trials supporting its use. High strength formula - Unique high strength formula that helps maintain optimum joint health. Highest quality ingredients - nutraquin+ only contains the highest quality natural ingredients. All raw materials are both ethical and sustainable nutraquin does not contain any animal derived ingredients. Exclusive to Veterinary Practices - nutraquin+ is only available from Authorised Veterinary Practices. Best value for money - On the face of it many joint supplements can appear good value however, many are very low in strength. The nutraquin+ range provides the highest strength products for pets whilst delivering the most affordable price. Boswellia Extract - (Boswellic Acids) - is a plant extract that supports the body’s natural anti-inflammatory processes. It plays an important role in maintaining smooth and comfortable joint movement. It does not cause the damage to cartilage that many anti-inflammatories do. Glucosamine HCL - An important building block for cartilage. It helps cartilage to act as a shock absorber. There are two forms of Glucosamine; HCL and Sulphate. Glucosamine HCL is the highest quality, purest form of Glucosamine, it is more stable and occurs naturally in every living organism. Glucosamine HCL has more pure Glucosamine per gram for improved cartilage formation. Chondroitin Sulphate - Helps maintain synovial fluid viscosity to aid joint support and is also an important building block for cartilage. Chondroitin Sulphate E from squid cartilage is the most ethically sourced form of Chondroitin with independent trial data to support its use. Ethical and sustainably sourced ingredients – we do not compromise on quality. Whilst some manufacturers use Bovine or Porcine sources of raw materials because they are cheap to include, nutravet do not use any animal derivatives, we only use the highest quality plant and marine (shellfish and squid cartilage) ingredients for nutraquin and nutraquin+. All ingredients are enclosed in vegetable capsules which are gelatin free. Glucosamine HCL (99% Pure) 505mg - an important building block for cartilage. It helps cartilage to act as a shock absorber. Chondroitin Sulphate (90% Pure) 2100mg - helps maintain synovial fluid viscosity to give extra joint support and is also an important building block for cartilage. Vitamin C (as ascorbate ) 500mg - a powerful antioxidant required to produce collagen. Collagen is the main supportive protein in cartilage, ligament, tendon, and connective tissue. Zinc Sulphate (as heptahydrate) 200mg - important for regeneration in the body and is also required for the synthesis of collagen. Boswellia Extract (Boswellic Acids) 750mg - a plant extract which plays an important role in maintaining smooth and comfortable joint movement. 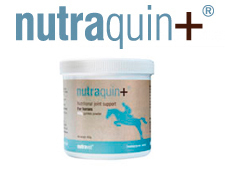 The nutraquin+ horse joint supplements are sold exclusively through authorised Veterinary Practices througout the UK.